warning C4297: 'A::~A': function assumed not to throw an exception but does note: destructor or deallocator has a (possibly implicit) non-throwing exception specificationYou may not have seen this warning with GCC or Clang, so you may think VS 2015 is just bothering you. Wrong! 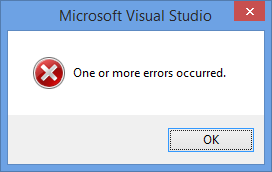 GCC should be warning you even more so than Visual Studio (I'll explain why), but it does not. And what the US is doing, with respect to spying and whistleblowing, compromises it. I was following a thread discussing the benefits of having the NSA and CIA, when they didn't even stop the Chattanooga shooter  who shot four marines, but not before writing about Islam on a public blog. Discussion evolved to that maybe the benefits are economic. That maybe these agencies don't stop most bad things from happening, but the US reaps benefits from stealing secrets from other countries. I find it disturbing to talk about stealing as something acceptable just because it's done between countries instead of between people. How would stealing from other countries benefit the people of the US? To make use of what you've stolen, you have to give it to some company. Does that really help the average American, or just tycoons with ties to spooks? I propose that any act of whistleblowing done demonstrably out of idealism, and in good faith, should be protected and given immunity for, one time in a person's life. People who have used this card should lose their career, and no longer be employable in this or any other career that requires clearance. But they should be able blow the whistle one time. Everyone currently employed in careers that require clearance would have to have this card still available to them  to avoid someone stacking a team full of people who've already been made to spend their card on purpose. It bugs me that OpenSSH pull all the same crap that Microsoft was vilified for years ago. They sabotaged the SFTP standardization process. They are "embracing and extending" as they please, and leveraging their market share in unilateral decisions that ignore the needs of other implementations. So that's one workaround we're adding in our next Bitvise SSH Client version. Based on my previous post about errors in destructors and aggregated exceptions, I first made a Reddit thread, and then a proposal in the ISO C++ Future Proposals group. Based on feedback I've received, the proposal has evolved, and would benefit from a page where its current state is published. I summarize the proposal's state. I will update this if I get further feedback prompting change. JustificationThere is a problem which I believe is limiting C++ in its potential for powerful expression. The problem is the single-exception policy, and its direct consequence: the marginalization of destructors, exemplified in recent years by how they're now marked by default noexcept. In a recent post, I suggested that when a destructor detects a cleanup error, throwing an exception is an acceptable way to report it. I argued that reporting problems is always preferable to ignoring them, so if a destructor does detect a problem, throwing is better than doing nothing. In the worst case, it will cause a whole program abort, which in unexpected circumstances is yet better than no reporting. It turns out that, with C++11, the language committee took the opposite stance on the issue. Quite simply, all destructors are now declared noexcept(true) unless you go to the trouble of declaring them noexcept(false) - in which case, you are on your own, and the STL doesn't like you. At risk of coming across like Jaden Smith, let me wax philosophical about programming. All code is thought, and development is unfolding of a thought process using the computer as external infrastructure in which to hang thoughts that don't all concurrently fit in your head. Therefore, the current state of your code reflects your current understanding of the problem you're solving. This understanding has to improve over time, but it usually does not radically change. Being good at development means being good at expressing your current state of mind in code; writing it so it's a true reflection of your thinking, rather than a muddled one. Therefore, when you write code in a way that it's in harmony with your thought, changing your thought in a small way will produce a similarly small change in code. If changing your thought in a minor way causes large changes in code, it means you're expressing yourself poorly. Pretty normal, right? Let's see how _ASSERTE is defined. This is good, right? Perform checks while testing; then, when most bugs have been weeded out, omit the tests for production, to reap major performance benefits. So speed! Such performance! Wheeee! This is a minor point of style, but it's important to me. When a pointer is const, the keyword comes after the asterisk. When a method is const, the keyword comes after the method. When a type is const, putting const after the type is always consistent. My below suggestions are not good for C++11 in GCC, Clang, and probably VS 2015 and later. I'm having an argument with someone who thinks Effective C++ is the end-all and be-all of all things. Specifically: The book has a chapter on how exceptions in destructors are tricky. The guy appeals to this as an authority, and concludes you should never throw exceptions in destructors, ever. Now, Effective C++ is a good book. I would recommend it to a beginner. If you're at a point where you need to read Effective C++, please do read it, get 3-5 more years of experience, and then give me a ring. Shortly, though, the guy is wrong. All code has to be aware of exceptions. All code has to get them right. Destructors are just somewhat trickier, because they have to be more aware of them. Microsoft Visual C++ has long implemented an extension to C++ that the standard language does not permit: temporary objects can be assigned to non-const references (lvalues). I find this extension useful, allowing for some elegant constructs that standard C++ does not permit. Here I have a function that converts a string from one code page into another, using MultiByteToWideChar and WideCharToMultiByte internally. The function needs to use a conversion buffer. For callers that might call this function many times in a row, it is more efficient to keep reusing the same conversion buffer than to reallocate it in every call to the function. More occasional callers, however, don't want the inconvenience of having to instantiate the buffer, and just want one to be created by default.